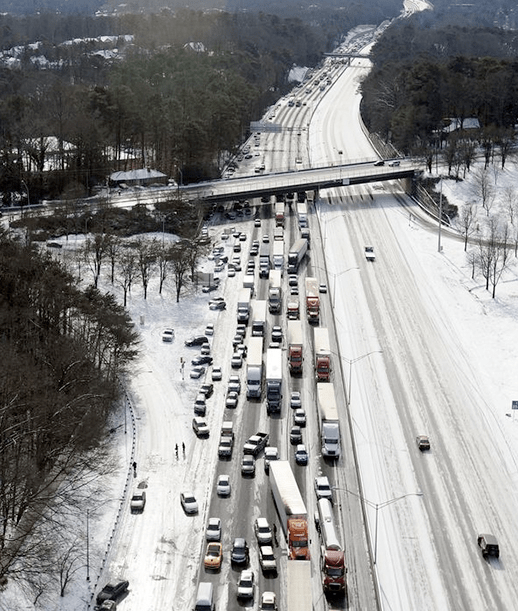 Atlanta’s Snowjam Disaster: How Much Was Sprawl to Blame? More disturbing reports from Atlanta’s epic frozen traffic jam disaster are coming to light today. It’s hard to believe how quickly the situation got out of hand when the region’s freeways got hit with a few inches of snow. With so many lives endangered, or at least disrupted, people are looking for someone — or something — to blame. But the problem wasn’t just a matter of insufficient snowplows or poorly timed school dismissals. It lay, in part, with a transportation system overly dependent on highways to connect a sprawling region, where jobs and schools are spread thinly around an enormous area, and most people have no choice but to get in a car if they want to get anywhere. While some point the finger at Georgia Governor Nathan Deal and Atlanta Mayor Kasim Reed for lack of preparedness, Atlanta transit blog MARTA Rocks! says they don’t deserve the blame. After all, Reed and Deal were both major proponents of a transportation ballot issue last summer called T-SPLOST that would have provided the region’s residents with more alternatives to highway travel. Unfortunately, the measure was rejected by 67 percent of the region’s voters in 2012. Now we know a rail line to Cumberland [Mall] wouldn’t have been built by yesterday if we passed [T-SPLOST], but we might at least have the reassurance that what happened yesterday may be less and less likely to happen over the years as our transit network and walkability could have expanded. Burns also laments the failure of the transportation tax measure, saying it illustrates a wider regional problem: the inability to act cooperatively to solve problems. “This snowstorm underscores the horrible history of suburban sprawl in the United States and the bad political decisions that drive it,” she wrote. T-SPLOST was supported by a majority of people who live inside Atlanta’s city limits. But these folks, Burns points out, make up only about 500,000 residents in a region of 6 million. Political power — and sheer numbers — lies in the suburbs. And Atlanta suburbanites have never been big transit supporters. The region’s suburban counties declined to extend MARTA into their backyards when the system was built in the 1970s. As a result, only a small fraction of the regional population is served by rail. And yesterday, the buses that provide patchy service to the suburbs were halted in traffic along with cars. If Atlanta, the region, wants to get serious about public safety, its mayors, county officials, and state officials will need to start practicing regionalism instead of paying lip service to it. And whether threatened by a dangerous pandemic, a major catastrophe, or just two inches of snow, we need to have ways to get around—and out of—the city other than by car. Meanwhile, Columbia University planning professor David King doubts that, going forward, smart growth policies can do much to prevent the next enormous snowjam in Atlanta. He says it would take decades of investment for the Atlanta region to develop a transit system that could make an appreciable change in the way most people move around. He says increased investment in snow plows might perform better in a cost-benefit analysis. And transit isn’t immune to weather emergencies either, adds Brandon Forby at the Dallas Morning News’ Transportation Blog. He says the Big D experienced some major snow-related backups in 2011, and then again a few months ago, when cold weather idled DART trains. Will we learn from this? Not at all. We had a minor version of this in 2011. What did we learn? Increase the number of plows and spreaders from 4 to over 30. This time around we will probably up that number from 30 to 100. And the results will be the same. Snow is rare in Atlanta, and winter storms aren’t the main reason the region should rethink its transportation and land use patterns. But a disruptive event like this should be a wake-up call. Maybe next time it won’t be a snow problem at all, but some other event that plunges the freeways into chaos. The lesson of the snowjam is that too much reliance on freeways can produce some unexpected and scary outcomes, if suddenly those freeways aren’t performing the way they should. I doubt sprawl was to blame at all. Chicago’s region sprawls and we don’t stop moving when it snows much more heavily than it snowed in Atlanta. Atlanta’s problem is the same as Seattle’s last year and the year before: municipal and regional DOTs don’t own adequate equipment to deal with snowfall (plows, salt spreaders), don’t budget to purchase additional equipment, and don’t budget to use them. It’s a tradeoff cities with histories of little snowfall make: save money on equipment that’s rarely necessary, and then suffer the rare economic impact when it does snow and roadways and people both stop being able to work. But Chicago’s region (and large portions of every other major American metro area) could stop moving if and when we run out of money and oil. We are too beholden to the automobile, and too dependent on the idea that basic jobs and services can be 10+ miles away from where you live and that’s no big deal. It is a historical anomaly to have “cities” (including Chicago) be larger than the state of Connecticut. It’s very possible that the 21st century becomes the century of not just economic contraction, but contraction in terms of what we think of as “place”. Our metro areas are “super-sized” just like most everything else in our society, and it is going to take huge quantities of money and natural resources to keep them that way. Even if we can somehow manage to continue to live this way, should we? No what mode of travel your city settles on, you’ll still have to remove the snow. A few inches of snow has never stopped MARTA to my knowledge. This type of gridlock happens routinely in Atlanta but just not at the scale of the entire metro regions. Let a tractor trailer take out I-285 during rush hour and your 1.5 commute will easily extend to 3-4 hours. Sprawl did play a big role here as Atlanta has built only 1 new freeway since I moved here over 20 years ago. Meanwhile the population has doubled with no expansion of mass transit. Moreover, Georgia refuses to address urban planning. They let developers run the show and this is what we get out of it, gridlock. The local governments have allowed run away development that generates a substantial amount of cross-suburb commuting. Twenty years ago, most people came into town for work. Now, the technology center has moved 40 north to Alpharetta causing most people to commute from their homes from Far East, west, and south of the city. A 45-50 mile one way commute is common in Atlanta because of all of the sprawl. Today, traffic on 400 northbound is just as bad, if not worse, that traffic heading downtown. For those folks lucky enough to take the subway, MARTA was truly a sight for sore eyes on Tuesday. She may have to run at a reduce speed, but she does run. Not necessarily. Rail can run fine on two inches of snow without any clearing. Walking works with snow, though obviously more pleasant without. Underground travel of any kind is obviously immune to snow. Elevated trains usually don’t need snow & ice removal (except on station platforms). Snow just falls through gaps between rails (and between ties) to the ground. Trains can be equipped with sand dispensers that scatter a tiny amount of sand on the rails in front of the wheels to maintain traction. But that wasn’t my point. My point is that snow (or no snow), 40 mile one-way automobile commutes, and “cities” that are built at semi-rural population densities are recipes for routine social, economic, and environmental dysfunction; and less-likely, but potential catastrophic disaster, when something anomalous (like a major snowstorm in Atlanta) happens. Is it reasonable to continue to want to (or be able to) have it both ways when it comes to modern American cities? That is, to treat a metro area as a “city” or “place” in terms of being an economic unit, but not to do so in terms of governance? Or in terms of human-scale design and functionality? It is time to return to the concept of “place” in a traditional sense: building communities where jobs and basic services are available at a human scale. Modern metro areas are highly-complex systems with very little built-in redundancy should something (weather, traffic, petroleum shortage, financial crisis) render inoperable our auto-dominated transportation system and speculative real estate markets (predicated on building new in further-flung greenfields). The 2008 financial crisis was a wakeup call. This snowstorm was another. We ignore this reality at our peril: our mode of (sub)urban existence is only possible thanks to automobile transportation that is prone to systemic disruption by any number of factors. A day is likely to come in the not-too-distant future that we rue our societal decision to sprawl ever outward. Not true. There are many elements on an elevated ROW that can trap snow and ice and interfere with operation–especially at switches, which may need to be heated depending on the temperature and snowfall to ensure they don’t freeze into inoperability. Moreover, rail yards aren’t elevated and trains will need to be able to transition from the yards to the system during snow. And even more, the design of the trains themselves can affect winter operability. Misplacement of air intakes for HVAC systems on many rail cars crippled the Chicago L in 1979. And again, as Atlanta officials have repeatedly said they don’t value investing in snow-preparedness, it is doubtful any of this would be planned for in advance by a hypthetically region-wide Atlanta rail transit system. So as I said, like it or not–or believe it or not–you’re still going to have to clear the snow. It’s obviously possible to screw up handling of snow with rail (Americans can screw up anything! :), but for a given amount of effort/money invested, you get a lot farther with rail than you do with roadways…. So long as the deeply-embedded “build it and they will come” paradigm continues to sustain a thoroughly corrupted high-level ‘real money’ game among the state and metropolitan area elite insiders across the US (and in many other countries now, too) — a game whereby those most savvy and well-connected among each franchise’s playmakers are repeatedly able to leverage the enhanced value of their well-in-advance land acquisitions served by new-alignment roads (acquired long before most anyone else knew of the prospective road project) through syndication at each and every stage of a road’s progression from formal authorization through construction into operation and beyond — the sprawling patterns of metropolitan development are quite likely to continue regardless of any urban planning or environmental initiatives at local, state or Federal levels. A significant amount of those enhanced-value syndication profits are routinely re-invested and recycled (laundered, in actuality) at every profit-generating stage into targeted charitable and political contributions intended to promote and support both 1) ancillary development-enabling programs (bond issues for required infrastructure in water, sewer, schools, parks and local road networks to allow real-world development activity to occur) and 2) enhancement of an insider’s influence for the next round of the game by ensuring election of specific candidates to all level of government office who will be favorably inclined to further their aims in promoting and supporting this longstanding scheme — one that evolved out of the land-grant railroad program in the mid-19th Century then grew strongly and expansively as it became widespread following inception of the Federal-Aid Highway program in 1916 when construction of the national systems of first paved roads and subsequently Interstate highways became a priority and a well-funded reality. It is that political, hidden “hand of the market” aspect which represents the principal element of institutional corruption which has been kept well-hidden by the actors, organizations and others involved along the combined supply chains of the paradigm who not only represent the primary beneficiaries that have gained enormous wealth, power and influence, but who will continue to strongly assert that power toward sustaining replenishment of the paradigm’s system of finance while aggressively and bitterly resisting any major change in either the underlying decision-making protocol (which they now largely dominate) or the flexibility in program objectives that allows the well-hidden game to be continued unchecked. Chicago doesn’t sprawl anywhere near the way Atlanta does. About three years ago, my local newspaper reported that a few real estate holding firms were buying options in a low income neighborhood. Most ignored it, and it was buried in the papers website. 6 months ago the local state university announced they were going to build a new health sciences campus that would take about 6 blocks of this neighborhood. Just this past week same newspaper announced how much the university paid for the properties in the area..4 to 6 times the worth. 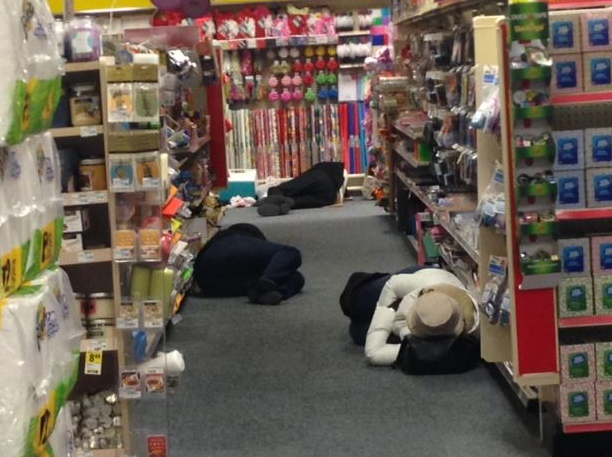 One word…Detroit. The city of Detroit was built in the low density mode. It is huge in land, you can fit san francisco, boston and Manhattan Island inside its city boundaries. Yes it does have a few high density areas, midtown and downtown. But they didn’t just stop at the city limits though. The kept building low density miles and miles into the suburbs. Some suburbs are up to 80 miles from downtown Detroit(Howell). People don’t realize that when it is said that the population of Detroit has dropped they are just talking within the city limits, Metro Detroits population has stayed or risen over the years.